Durable, low-cost laser engraved name badges fit into the tightest of budgets, and still gives your employees a professional appearance. Available in either 3 x 1 inch or 3 x 1 1/2 inch sizes. These economical tags can be laser engraved with your logo, name and title. A large selection of color combinations are available. 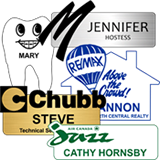 We produce full color plastic name tags with multi colored logos or color illustrations with no large setup costs. Available in either 3 x 1 inch or 3 x 1 1/2 inch sizes. Your logo can be reproduced in full color. The tags are available in three background colors; gold, silver or white. If you have a unique size or shape that you would like for your name badges we can create it for you. We custom cut these designs out of our two color engraving material. Have Questions, Need A Quick Answer, Just Want To Ask A Few Questions?